CRUSH earned his Grand Champion Excellent title in 2018 while winning BEST IN SHOW under Paula Hartinger of the USA at the Evangeline Kennel Club shows. Only a handful of Samoyeds have this title ! 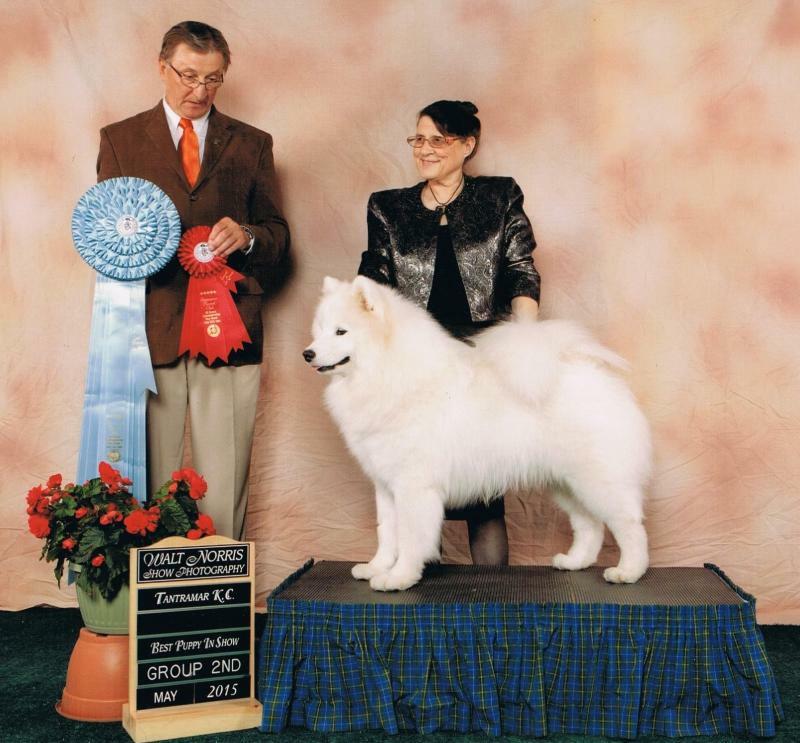 He was ranked #4 Samoyed in Canada for conformation for the second year in a row and #1 Samoyed in rally obedience for the third year. He also ranked #7 in group for rally obedience. In 2017, he ranked #3 in the rally working group as well as #15 All-Breeds in rally ! Crush had a busy 2018. He earned his Companion Dog Degree, his Rally Advanced Excellent 2 title (first Samoyed in Canada to attain this) and his Rally Master title (his half-brother Dushanbe's Makin' Music 2 RM was the first). He is a smart boy, sweet and willing to please like his mom....and all wrapped up in a beautiful package. Hips hips and eyes OFA certified. DUSHANBE'S SHOWCASE, CGN RN (sired by Ch & CFC Ch Dushanbe's Rock Legend, CGN RN x Ch & CFC ELITE Ch Dushanbe's Wintermist Showboat, CGN RI PCD TT ROMC). Both her parents are Group First winners and have their Canine Good Neighbour title and Rally Novice degree showing they are smart and easy to train as well as being well adjusted members of the community. This planned breeding is a double-up on our KYAH (pictured on our GIRLS link), who has excellent shoulder angulation and sidegait and a perfect single tracking rear. Kyah is a daughter of our TENNYSON who is a multiple group placer with the same fabulous shoulder layback and wonderful single tracking rear. He has a stunning head and coat that make people want to throw their arms around him and give him a hug. He is pictured on the BOYS link. Bristol/Dylan puppies at three weeks of age.